No matter what temptation or trial Satan is trying to use against you, we have the power of the blood of Jesus Christ covering us. The blood that even demons tremble (James 2:19) you will not be overcome! If you are under attack today, speak against Satan in the name of Jesus Christ. “I rebuke you Satan, I rebuke your sickness, I rebuke your addictions, I rebuke your anxiety, I rebuke your depression, depart from me in Jesus Name Amen! This entry was posted in Jesus on January 30, 2017 by Unashamed of Jesus. Why does God allow evil to happen? This is a question most of us have asked or have been asked. To better understand let’s use America as an example. Citizens of the USA are born free, but with that freedom wouldn’t you say a lot of people abuse it? Americans have freedom of speech but then use this power to burn American flags. Americans have a right to bear arms but some choose to acquire guns illegally and use them for crime or murder. Americans have religious freedom yet sue each other if that religion offends them. These are examples of free citizens abusing their power. The same is with God, we all have the gift of free will. God doesn’t force anyone to worship him or obey him. Some abuse this power of free will to do evil. Should God step in and control every evil act being performed? Then he would be a dictator and not a loving Father. The reason we have evil is because people choose evil. Just as Christians, we are free people, because Jesus has set us free. But as the saying goes, with great power comes great responsibility. As Christians we choose to live free as Gods slaves for righteousness and not evil. Because all evil comes from Satan which leads to death. This entry was posted in Jesus on January 28, 2017 by Unashamed of Jesus. Are you in a Spiritual Slumber? The word “slumber” means to sleep or be in a state of inactivity. Often in our lives we can start to become complacent. We go through the motions and do what the bare minimum we have to do. But as Christians we must remember Jesus said he would “Return as a Thief in The Night” (Revelation 16:15) meaning Jesus will return at a day and time when nobody expects him. As Jesus also said the day and hour nobody knows of his return except God (Matthew 24:36) So its important we live every day as if Jesus were to return. As we know its normal for us to occasionally lose our fire, or get worn out or down on ourselves. That’s why it’s also very important that we encourage one another and build each other up (1 Thessalonians 5:11) Its equally important to reach out to fellow Christians and give them some support and encouragement periodically. This entry was posted in Jesus on January 27, 2017 by Unashamed of Jesus. This entry was posted in Jesus on January 26, 2017 by Unashamed of Jesus. There is power in the name and blood of Jesus Christ! When you understand and believe this, then you can become an overcomer through Christ. As God revealed to us “By his (Jesus) stripes we are healed” (Isaiah 53:5) By the blood of Jesus Christ we are all healed, we are all overcomers. I keep my eyes always on the Lord . 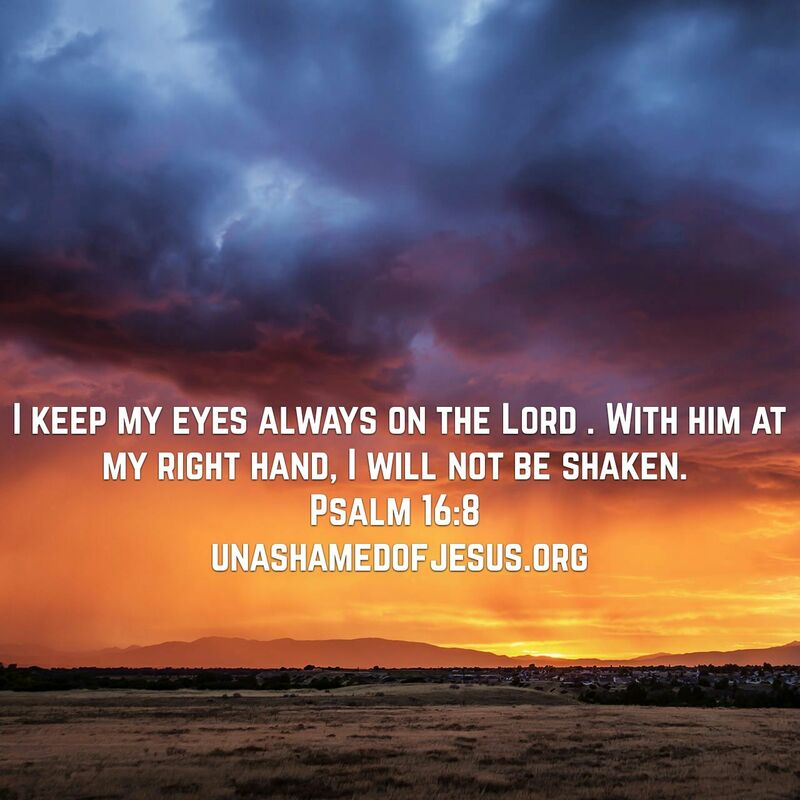 With him at my right hand, I will not be shaken. 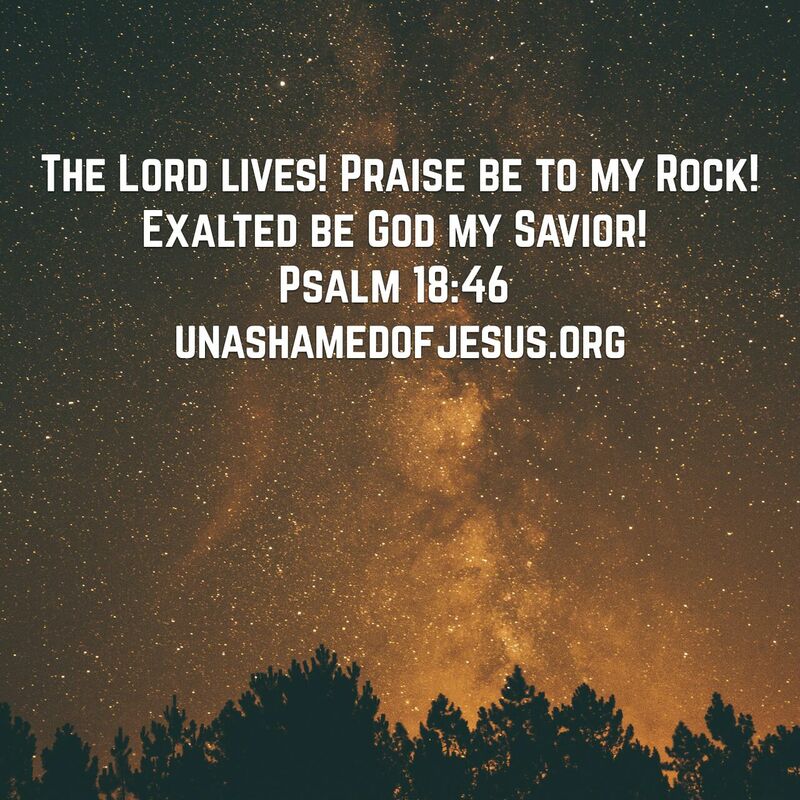 This entry was posted in Jesus on January 25, 2017 by Unashamed of Jesus. Do you live in fear of the future? What is perfect love? Many people live in fear of their future and in fear of God. But through Jesus Christ we have been made perfect by the love of God. Even though we didn’t deserve Gods mercy he gave it to us anyway because his love and mercy endures forever. We know the wages of sin is death, however Jesus has taken that death for us. Therefor if you are born again through Christ, you don’t have to fear death. Perfect love has defeated sin and death on the cross. Perfect love can only be obtained through the blood of Jesus Christ. Because he loved us we can live. For God gave us a spirit, not of fear but of power, love, and self control. (2 Timothy 1:7) Notice fear and love are total opposites of each other. You can’t have perfect love with fear. The Spirit of God not only drives out fear but gives us love. Without love we can’t be Children of God. This entry was posted in Jesus on January 24, 2017 by Unashamed of Jesus. Lord , who may dwell in your sacred tent? Who may live on your holy mountain?